I just posted a new version of plotSimmap and a new minor phytools version (phytools 0.2-74). The updates mainly do the following: (1) allows user control over close to the full range of plotting options in from plotSimmap(..., type="phylogram"); (2) change the shape of the line caps from round to square (to bring into alignment with plotSimmap(...,type="phylogram") and common sense); (3) improve the alignment of labels with the terminal edge their offset from the tips; and, finally, (4) fix some problems where not enough space was left around the plotted trees to allow the labels to be added (this also seems to affect plot.phylo(...,type="fan")). The result looks very nice. 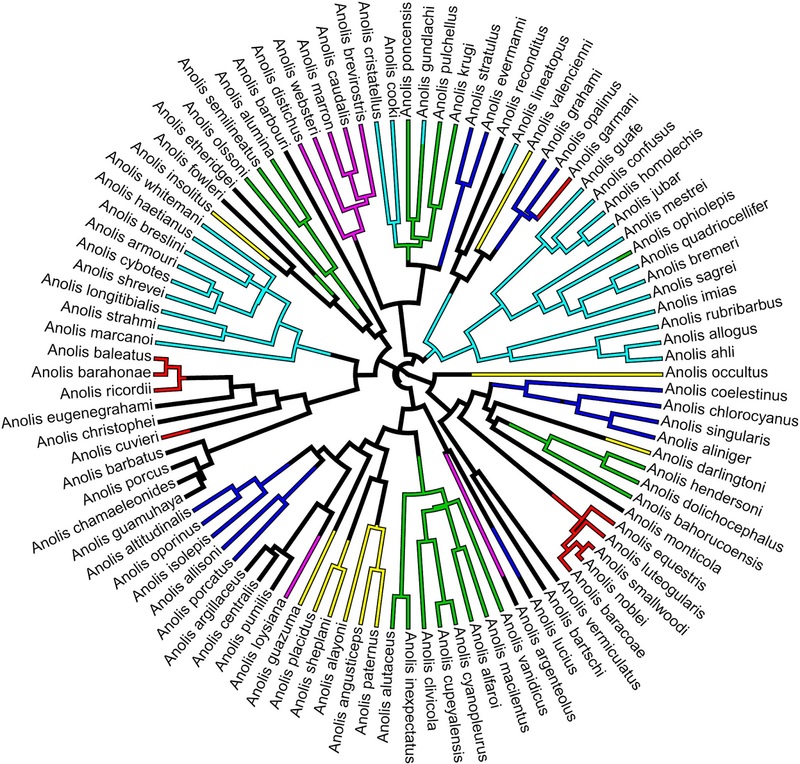 Here's a quick demo using the phylogeny of 100 Greater Antillean anoles from Mahler et al. (2010) and a stochastic mapping of "ecomorph class" (including non-ecomorph species) on the tree. leg gives the color→ecomorph translation. "black" "red" "green3" "blue" "cyan" "magenta" "yellow"
I also now allow type="fan" trees to be plotted from plotTree, which uses plotSimmap internally.